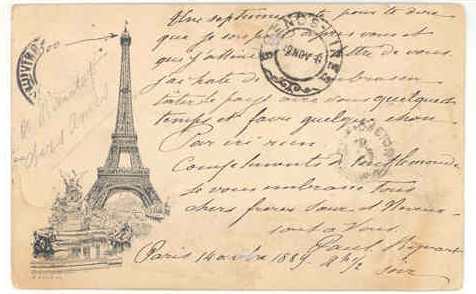 This illustrated postcard was sent from the Universal Exposition held in Paris in 1889. The Exposition was also the occasion of the 100th Anniversary of the French Revolution. This Exposition is famous for the landmark it left for Paris - the Eiffel Tower. The Tower is the subject of the illustration on the message side of this card. There are two Exposition CDS. 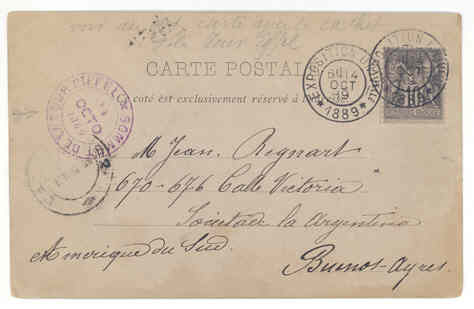 The card arrived in Buenos Aires on November 9 and received a CDS on the message side. There are two additional postal markings on the front and two more on the back. I expect that they are transit marks; however, they are illegible to me. 10c black on lavender paper (Scott 91).